Doming and Potting Equipment is available in many configurations and can accommodate products of varying shapes and sizes and job orders large and small. If doming or potting, you have quite a few systems from which to choose. Before you begin, it might be helpful to review some basic features and terms associated with doming. These descriptions apply primarily to machines that dispense two-part polyurethane resins or use two or single part UV, a common type used. 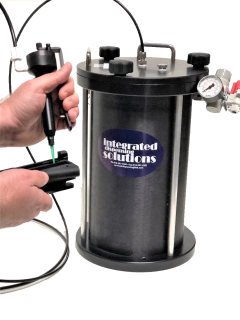 If you are doing a low production run of two part epoxy, remember that IDS will be happy to quote both a premixed/frozen version in easy to use syringes and even a small freezer to keep them safe. As always, please call us at (818) 597-4300 or email to: service@dispensinglink.com if you have any question or comments for our service team. Meter-mix is also referred to as meter-mix-dispense, which means the dispensing machine meters (measures) the doming materials by volume and then mixes the components before depositing the resin onto the products. Static mixer usually refers to the dispensing machine's mixing unit, which is responsible for blending doming materials. A static mixer is often a simple, rigid, plastic tube that houses a series of helical elements. As both components of a two-part polyurethane resin enter the static mixer, they're sheared and blended together when they pass over each element. The result is a homogenous mixture ready for deposit. Static mixers are common in both entry-level manual and high-end automatic dispensing systems. Parts A and B never touch until they enter the mixing tube. Dynamic mixer The dynamic mixer is similar to the static version in that it relies on the helical elements, but it also consists of a pneumatic motor that is integral to the dispensing head. This motor complements the static mixer's shearing and blending effect with rotary motion, which provides additional mixing. This type of unit is usually best employed in high volume, constant flow applications. If you use a single component UV adhesive, you can eliminate a lot of the headaches that are inherent in a two component system. The right UV Adhesive is important. It will be a little more expensive, but throughput will increase dramatically. 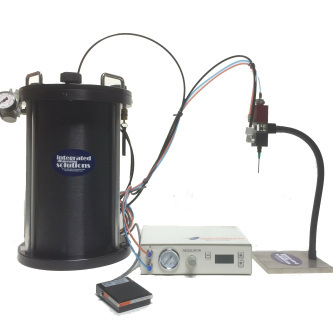 When doing a UV Dispensing system, you are using a single component material, you can choose a lower cost Shot Meter or Valve with which to dispense the materials. Choose from any of our Robots and speed things up even more. If you are looking for higher production, use a valve and valve controller mounted on a robot, fed by a reservoir of any size. Add a Conveyor Belt and increase production as required. 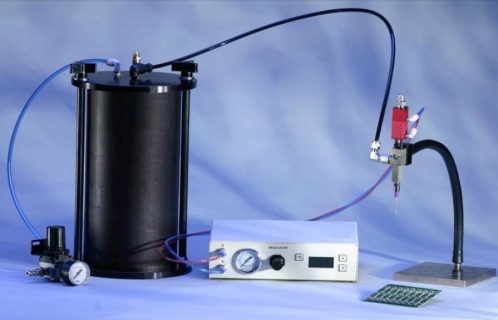 After choosing the materials and dispensers you will require a UV Curing System. They will range from a basic low cost operator controlled Flood System to an IDS MotionCure UV Flood Curing System, an integrated Conveyor and Curing Head. 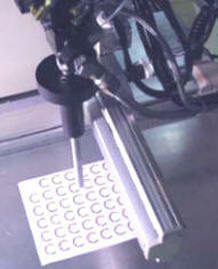 You can make a minimal investment in the technology by using a hand-held dispensing syringe.Some semi-manual pneumatic dispensing units may come with foot switches and other control options, but expect to index your sheets of printed products and move them along the production line by hand. Dispensers in this category, while manually driven, offer repeatability of shots, accuracy, and excellent production pace.